Increase impulse sales of to-go items at grocery stores or showcase culinary creations at catered events with this Visions 12" clear PET round catering tray dome lid! Boasting a crystal-clear design for optimal visibility and fast product identification, this dome lid is perfect for covering deli meats and hors d'oeuvres. It will easily snap onto your 12" catering trays with a secure seal and can even be stacked for compact storage, transportation, or display. I’ve been using these trays and lids in my cookie platters for two years now and i love them! Very professional and affordable for my larger Christmas cookie orders. This Catering dome tray is perfect for locking in on to the catering bottoms. It seals really well, meaning that even slightly liquid items aren't going to spill out and into the rest of your lineup. You can not throw a party or event without the use of these lids and the trays that go with them. These are high dome which allows for more variety of product. The high dome lid will come in handy for use of sandwich trays, loaded down veggie trays, fruit trays and anything else that requires a taller than normal lid to keep it covered! I use these with the 12" Thermoform Catering/Deli Tray to as cookie platters. The 12" nicely displays up to 18 3" sugar cookies without having to crowd the tray. The lid can be a bit difficult to remove. These with the bottom tray makes a great product. I use these for my small cookie trays and fit 6 dozen of cookies on this tray size. Non food items can add up quick, so we gave this product a try in hopes of replacing our previous disposable catering trays. Same quality at less than half the cost. Top seals tight. Fits base. Nice small size for 6-8 sandwiches. Great for small catering job. When I removed top turned over and top was great to hold chips. This lids are study and very easy to use. The high dome is perfect for larger treats or for when you want to really stack the goodies high. I purchased a couple of cases of this item. These lids for the 12" catering trays are solid, durable and easy to both close and open. Will definitely be re-ordering them again. This is the standard in sandwich catering. These kids have very sturdy construction, while displaying your product in a fantastic fashion. Don’t forget to order the corresponding catering trays. We Love using these lids! And they're such a better price than when I was getting them locally! Nice and sturdy and looks so nice! Perfect! The high dome lid makes it easier to stack my pinwheels for catering jobs. The price is great and the plactstic is very durable. This lid works great for showing off your food. We use it for catering desserts, subs, sample trays, everything. Nice small size for a little food if you want to show what you can do! We love the high dome lid option to pair with the catering tray. This helps us fit more cookies onto the tray, which meets our needs a little better. We love these catering tray lids for our work. They are a perfect way to ensure that catering trays are safe and that they aren't smushed. Works very well with the matching bottom. These look very professional when I deliver food to my clients. I will definitely buy these trays again. Top fits the accompanying tray snuggly. I've been able to store crackers in it for several days and they stayed fresh. Nice high dome for a stack of crackers or cookies. During the holidays we add take out or pick up for specialty pies. Having the ability to order smaller amounts of these deep pie carrier dome lids really raises the visual aspect. Bought these to go with the 12" Visions Catering/Trays. The have a right seal and lock down perfectly. Sometimes it's challenging to remove the lid but that's not a bad thing. Very Durable and the perfect size for small catering platters . I recently bought the 18in and loved them so much I wanted to have all sizes available to use. A very clear and sturdy lid. Locks into place to the bottom tray very easily and is easy to take off as well. Very nice prevention. we use these for our catering orders. they do a good job to secure our food inside while at the same time displaying the items for our customers to see. Purchased this item to do food trays for a catering event. They held up well however, you must be careful not to overpack bc the lid will need to be taped on to stay in place. The Vision 12" dome lids are a good match for the Thermoform deli tray. The lids stays in place and fits well. We use them for sandwiches, cookie, and much more. The high lid allows you room for bigger sandwiches and no crushing or smashing. We use these lids for our small trays when we do catering for events. They stack well, are packaged well when shipped, and they look pretty and professional. We use this item to deliver catering platters to many different types of locations. It fits snugly, but if jostled can pop off the bottoms. This item is worth it just because of the cost alone, much more cost effective and provides the good quality for catering uses. Customers are always pleased that platters can be covered with this dome lid. They allow you to stack platters as well so you really can't go wrong. We just received these today, and we love them. We had been using rolls of cellophane to wrap our trays prior to ordering these. They are very sturdy and black tray bottom we also, purchased make our products stand out on them. The perfect solution for our needs. Much more affordable and labor saving than our old method. Highly recommended! I am very pleased with the quality of these dome lids. I use them for our platters all the time and i have no complaints. Yes! The same great containers they sell at Restaurant Depot at half the price. Perfect for any sort of function, these look great and transport with ease. 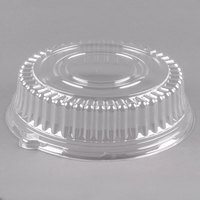 We love these catering dome lids and use them for all of our smaller catering orders paired with the 12" trays. They fit well, are easy to snap on and to remove and the food looks great in them. Highly recommend for the price! The perfect accompaniment to the black deli trays that I use to display, transport my decorated sugar cookies. It creates a nice seal and a great way to present the cookies to my customers. These lids are crystal clear. They snap on and off the tray easily. They are secured when sealed and are sturdy. You can not beat the price here! We like these clear Visions 12" round catering tray domed lids, and the catering trays they cover. We use them mostly for gardens salads which our customers can grab and go. Since the trays and lids are clear, it makes our delicious salads easily seen, and identified by our customers, and that visibility increases our sales. You eat with your eyes first! The Visions brand lids and trays are awesome and priced just right. The lids fit tight but are easy to get on and off. Great quality! The lids are sturdy and close well over the tray. The design is eye-appealing and makes it easy to stack many trays over each other. Some dome lids are terrible to get on, these are not. The clear lid makes our product look great and it is very sturdy as well. This is the best lid I've used in a while, it goes right to the sided of the platter making it easier for the food to not move during transport. This is a great product for big or small catering events. Goes great with tray counterpart and is very convenient when transporting food from one place to another. We use this for our smaller size party platters. The tops are a must - to go with the bottom tray. They hook in easily but note that they lock in about an inch from the edge of the actual tray so you lose surface space on the tray. Do not hesitate to purchase these! The dome is nice and roomy and fits easily to the accompanying base. I was able to fit 60 cookies of varying sizes onto the base, and the dome lid allowed extra space with no crushing! Item is exactly what I expected. We use it for party sandwich kind of thing. Easy to use. Great price. Would buy again in the future. Looks good and it does cover fine. I wish it was a little taller so I could have 2 stacks of subs which is now not possible. So I can get once stack and then there is a lot of empty space between the bread and the cover. So it's not efficient for my purposes of serving submarine sandwiches but may be perfect for sliced bread. Only major flaw is that it is very brittle and crack easily which then ends up in garbage. These are really pretty, they fit awfully tightly on the trays that they are supposed to match, but at least I don't have to worry about them popping off or coming loose. Makes for a very nice presentation of my bakery trays! Thank you, just what I expected and needed. Will purchase again very soon. Great doing business with Web Restaurants store. Will order more supplies soon. These lids not only protect my products, but showcase my muffins and cupcakes. I love them! They take my products to a whole new level, especially when paired with the coordinating trays. This was a very good & cost effective replacement for an over priced product that I have been using. Lid fits easily to base and has a elegant look. This dome works great when used with coordinating catering tray. It has a tight seal and keeps items from cookies to fruit to cheese fresh. This item is what I need to almost complete my look. I will be able to cover the food of my honoree and be able to serve the food also.